This is my mom's recipe and method of making tom yum goong and it is the best! It is simple and fast to make. 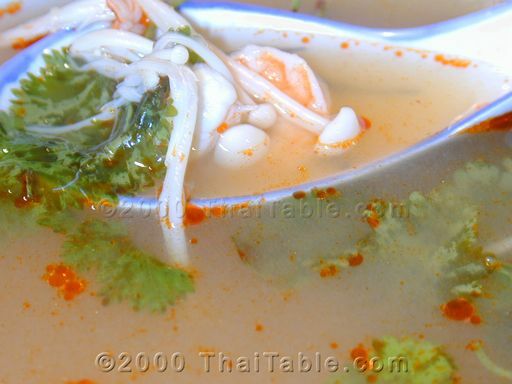 This is definitely a recipe that you can only balance by taste -- tom yum goong should never be bland, but hot and sour. I have seen many recipes calling for chicken broth. It is totally unnecessary! 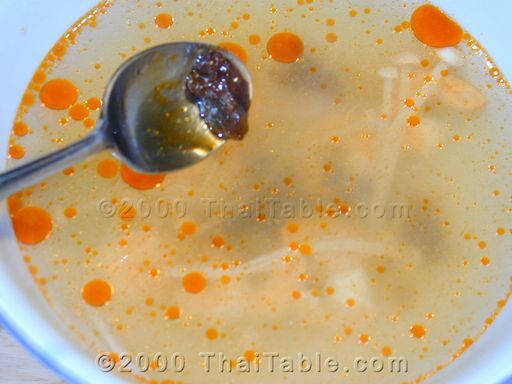 We don’t use chicken broth in Thai cooking like in Western cooking. Tom yum goong should have shrimp flavor, not chicken! I serve this soup directly into individual bowls for each person. Boil water in a 2 quart pot. Peel and de-vein the shrimp and set them aside. Cut lemon grass into pieces, 5-6 inches long. Use the back of your knife to pound the lemon grass, just to bruise it to release the flavor. Tie the lemon grass into a knot to make it easier to manage. 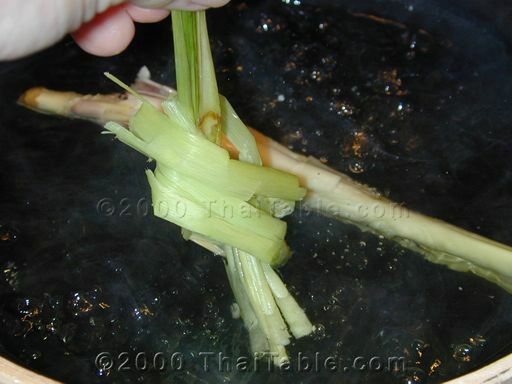 Drop the lemon grass in water and let boil for 5 minutes. 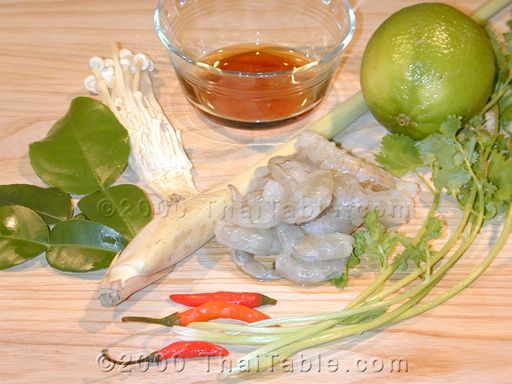 Remove the stems from the kaffir lime leaves and add the leafy part to the pot. Clean and halve the mushrooms and add them to the pot. Let it boil. Add the shrimp and turn off the heat. 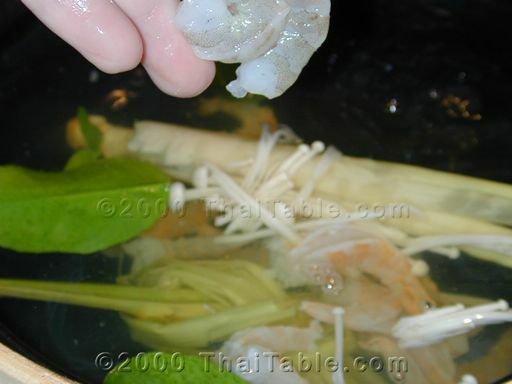 Shrimp gets tough very quickly, and will cook even when it is just sitting in the warm broth. Scoop the shrimp and liquid into the serving bowls immediately. As soon as you add the liquid to the serving bowl, you will see that the broth becomes cloudy because of the lime juice. Add the nam prig pow. Sprinkle with cilantro and serve. Be very careful, the peppers can be hot. Take a small sip at a time. Add more fish sauce and/or lime juice if it tastes bland.